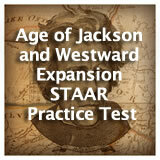 Age of Jackson and Westward Expansion unit contains 16 learning experiences. Students learn about the changes to and expansion of voting rights during the 1800s. Then, students evaluate the arguments in favor of and against the changes involving white manhood suffrage. Students learn about the causes and effects of Jacksonian democracy and the impact of the election of Jackson on American politics. Then, they learn about the spoils system and investigate if the spoils system is evident in today's political process. Students learn about or review the key concepts, events, and people from the Age of Jackson Then they evaluate whether Jackson should remain on the 0 bill or be replaced by Harriet Tubman. 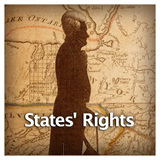 Students learn about the South Carolina Nullification Crisis and Andrew Jackson's Nullification Proclamation. Then, they research current situations where states have taken action to nullify federal laws. 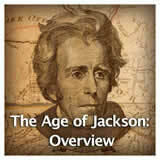 Students learn about Andrew Jackson's decision to dissolve the Second National Bank of the United States and the economic crisis that followed. 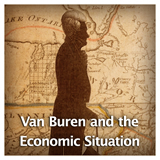 Then, students will explore the Panic of 1837 and the actions Martin Van Buren took to stabilize the economy. Finally, students will evaluate political cartoons about the Panic of 1837. Students learn about the events leading up to the Indian Removal Act of 1830 and the subsequent removal of the Southeastern Native American Tribes, including the Cherokee who were evacuated in 1838 in a journey described as the "Trail of Tears. " Then, students compare life for the Native Americans before and after the Indian Removal Act. 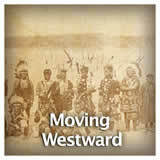 Students learn about nineteenth-century developments in transportation that led to westward expansion and increased economic development in the United States. Then, students select one mode of transportation and create a timeline of the key events in its development. Students learn about the dangers and challenges of traveling on the Oregon Trail in the 1800s and why settlers, fur traders, and missionaries were willing to make the difficult journey. 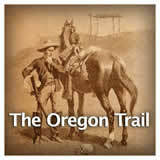 Then, students will write a journal entry from the point of view of someone traveling on the Oregon Trail. 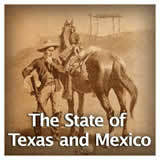 Students learn about Texas declaring independence from Mexico and the establishment of the Lone Star Republic of Texas. Then, they learn about how Texas became part of the United States. Finally, students will compare the constitutions of the Republic of Texas with the United States. In this experience, students learn about the history of missions in the southwestern area of the country. 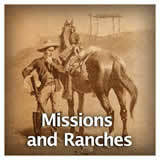 Then, students learn about the ranchos period, which followed the mission era. Finally, students prepare a presentation describing what life was like for the Spanish and Native American living on a mission. 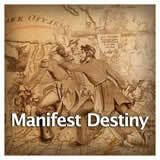 Students learn about the concept of Manifest Destiny and how it related to America's westward expansion in the mid-1800s. Then, they learn about the Mormon exodus to Utah. Finally, students evaluate the painting "American Progress" and discuss how it depicts the idea of Manifest Destiny. Students learn about the causes and effects of the U.S.-Mexican War including information about how Abraham Lincoln felt about the War. Then, they complete a map identifying the Republic of Texas, disputed territories, and the land gained as a result of the War. 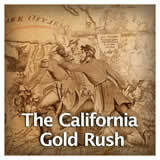 Students learn about the California Gold Rush and its impact on the environment, economy, population, and development of California. Then, students complete a map showing the areas of California impacted by the Gold Rush. 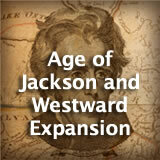 including the Age of Jackson and Westward Expansion Unit.